The Adventure is the second and last part of the road to happiness. Once the Adventure is complete then one is at the threshold of happiness. The Adventure is that part of the road from the “good life” to the threshold of happiness. This segment involves exercising the virtues, attained during the Journey, to complete one’s call or mission in life. The virtues required are: wisdom, courage, temperance, and justice (as mentioned by the Stoics). The acquisition of these four virtues delivers one to the threshold of happiness. Wisdom is the virtue to recognize the call or summons that has been sent and to see the path of the Adventure that must be undertaken to follow the call. Courage is the virtue to accept the call and begin the Adventure along the illuminated path. Temperance is the virtue of moderation and fortitude to withstand the many temptations of power, fame, and riches that will be encountered along the Adventure. Justice is the virtue of caring for one’s family and community by a willingness to deliver the boon or treasure (the reason for the Adventure) captured during the Adventure. Those who exhibit these four virtues will be the ones most capable of delivering the boon of the Adventure to help society to flourish. These same individuals will be the ones most likely to reach the threshold of happiness. In my book, I present a number of artists that portray each of the three segments of the Adventure, which are displayed in the fourth, fifth, and sixth galleries. It just so happens that three specific paintings from my book are all that is needed to illustrate the Adventure. It is also interesting that these three paintings represent individuals alone on their quest. These paintings of the Adventure differ from those of the Journey, in which the characters are surrounded by one’s family and/or friends. The following paintings represent individuals attempting to satisfy the final Maslow need – self-actualization. The four paintings that I discussed in earlier posts (those by Van Gogh, Brueghel the Elder, Renoir, and Rembrandt) illustrate individuals attempting the satisfy the fist four Maslow needs in an attempt to enjoy flow experiences. What I would like to do in this blog and several future blogs is present just the three paintings that illustrate the Adventure. It will be interesting to see how each painter goes about presenting the corresponding segment of the Adventure and how they differ from one another. Let’s begin. 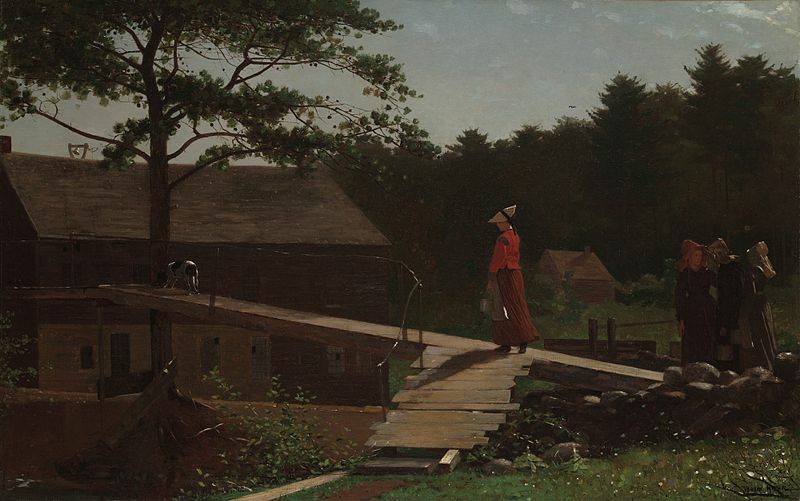 This first painting, Old Mill or The Morning Bell, by Winslow Homer depicts a girl who has the wisdom (first virtue) to see the illuminated path of her Adventure – a path away from her friends (friends from her Journey segment of the road to happiness) and towards the unknown to the left of the painting. The painting also express the second virtue of courage. She is not afraid to follow the path or calling that has been put before her to travel. This picture represents extraordinary subtlety. The painting presents the path, previously taken, leading to the fork in the road where the girl is standing. She appears to have made her decision to travel upward along the road less traveled rather than downward towards the more popular path of her friends to the right. The sunlight is bathing the girl in warmth. The picture does not show us where the girl is traveling except that it is an upward climb into the distance. Perhaps this is the artist’s interpretation of the acceptance of the call; leaving others behind and entrance into an unknown future, willingly accepted. Two additional virtues will be needed to bring the adventurer to the threshold of happiness. This entry was posted in Uncategorized and tagged Cardinal virtues, courage, Homer, wisdom on May 29, 2015 by oliver. Summarizing my previous five posts: for those that are attempting to lead good moral lives there are three basic moral philosophies: consequentialism, deontology, and virtue ethics. I believe that consequentialism, while possibly noble, is one that deemphasize individual choice and performance for the sake of the good of society. As such, it can be used to justify actions that are harmful to individuals for the sake of the social good. This philosophy robs the individual of his/her pursuit of happiness and the future flourishing of society. Ii is very difficult to accept the premise that the ends justify the means, and that the individual is subservient to the will of society. I believe that deontology, the most widely accepted of the three philosophies, also while possibly noble, is one that emphasizes the individual and his/her actions, but without regard for the consequences of those actions. Just following what one believes to be the duty or obligation for certain actions, without considering the consequences of those actions, leaves the individual and society at risk. I believe that virtue ethics is the only philosophy that is concerned with the individual making the right decisions for the right reasons. The virtues found in good people make sure that this happens. The virtues of wisdom, courage, temperance, justice, and love of neighbor, are displayed throughout the fine arts as the models for achieving happiness and the flourishing of society. A person who possess all or some of the virtues will lead to good actions. In other words, a good action will only come from a good person, and a good person is one who has earned or is earning the virtues. Not only do the great masters of the fine arts present the virtues a necessary for good actions, but the great myths, great philosophers, and modern positive psychologists also support the earning of the virtues through hard work and preparation as necessary for a moral life and one that leads to individual happiness. The virtues are the catalysts for the individual to seek out and capture the boon that is the gift to society. The virtues (of which at least wisdom and courage are earned from a loving family, and involvement and exposure activities earlier in life before acceptance of the call to adventure) are the instruments by which the individual is awarded happiness and society flourishes. Above is Homer’s interpretation of the acceptance of the call to adventure (Gallery Four in my book). The girl has the wisdom to see her future course of action and the courage to follow the path, even though it is uncertain where the path will lead her. In this painting, another one by Homer, we have the adventurer who has fought the many trials and has captured the boon for his society (the end of the Civil War, as displayed in Gallery Five of my book). He is displaying the virtues of temperance and justice (concern for the common good) – wisdom and courage to accept the adventure were earned earlier before battle. But one thing is missing, happiness – the veteran has not yet been recognized for his efforts by his fellow countrymen. 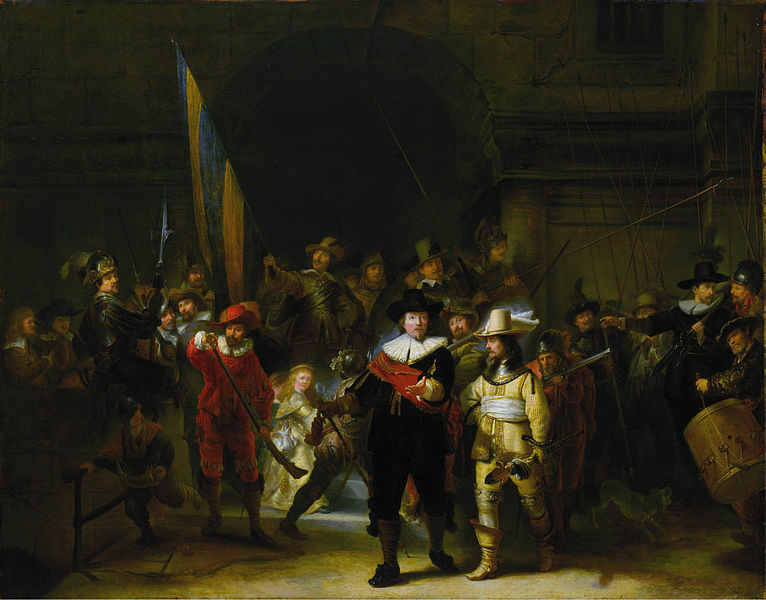 In this masterpiece by Rembrandt, we see the protectors of the community being lauded by the military followers as well as the citizens (depicted by the little girl). They have fought the many battles to capture the boon (safety and security of the community) and have been able to return back to the everyday world as a result of the love and admiration of their friends and neighbors (as seen in Gallery Six of my book). This great Rembrandt painting illustrates that it is the responsibility of individuals and not the state to determine the future of the community (consequentialism is not supported in this painting). Also, the painting illustrates that the mere duty or obligation of the few military men to protect the community is not sufficient as well. The lighting and the placement of the small girl, representing the common community that it relying on the military men, is prominent in the painting, and for a special reason. She represents the admiration and love for the heroes that have returned from the adventure: it is she, the personification of love of neighbor, who is welcoming the men across the threshold back to the everyday world (a personification missing in the Homer painting above). It is this love of neighbor that brings happiness to the men (who have earned the virtues to succeed in the adventure) and the gift of their boon of protection to their society. A mere sense of duty (deontology) would not have been sufficient. It is the application of the virtues that makes this painting a masterpiece. This entry was posted in Uncategorized and tagged consequentialism, Deontological ethics, happpiness, Homer, Philosophy, Rembrandt, self-fulfillment, Virtue, Virtue ethics on December 2, 2013 by oliver. This is the final post on The Natural. Whether you read the book or watched the movie, the critical question to ask is: Who is the Natural? You would think that the obvious answer is Roy Hobbs with his natural talent at baseball. I don’t think that the author intended the “natural” to be Roy Hobbs. In the book, Roy was a failure, not unlike many other failures that have lived. He went very far, having accepted the call to adventure, but soon lost during the adventure to temptations and self-centeredness. He did not have the virtues of temperance and justice to see himself through the adventure and to the ultimate love of Iris, pulling him out of the adventure back to the everyday world towards happiness and the flourishing of his baseball community. After Roy struck out and lost the game for his team, he recounted to himself, ” … I never did learn anything out of my past life, now I have to suffer again…. He stared into faces of people he passed along the street but nobody recognized him.” The only solace that Roy can take is that he did accept the call to adventure and will be given another opportunity at some time in the future to begin a new adventure. Had he recognized the call and not accepted it, he would not even have been given another opportunity. And that is the reason that Iris is the “natural.” Because she exhibits all the virtues. She had her own adventure earlier in her life. That adventure required that she possess all the virtues for her to succeed. And she did succeed. And now, she is willing and able to welcome those at the threshold of the return back to the everyday world. She is the invisible hand stretched out in the Homer painting, The Veteran in the New Field, welcoming the veteran to a new world. She is nature, uncontaminated by vices, having attained happiness, with her boon being to help others cash in their own personal IOUs. I can’t stress enough reading the book and watching the movie. I think that it is best to watch the movie first – it will make understanding the book easier. This entry was posted in Uncategorized and tagged happiness, Homer, self-fulfillment, The Natural, Virtue on November 19, 2013 by oliver. In my previous posts, I talked about how the thinkers and artists provide a three dimensional view of happiness, with the thinkers and artists verifying one another. I also talked about how the harnessing of the entrepreneur within each of us serves as the vehicle for traveling within the three dimensional pyramid. The vehicle takes us upward to the apex of the pyramid if we use our entrepreneurial instincts. Once prepared for the journey with assistance from our family and a just society, we enter into “involvement” activities and then “exposure” activities leading to proper self-esteem. We then must recognize and accept the call, if sent, to begin the adventure. The virtues of wisdom and courage help us with this segment of the adventure. We must all resist temptation and use the preparation earned earlier to fight the many battles to secure the boon. Once the boon is secured, we must be willing to return to the threshold (justice) and await help to return back to the everyday world with the boon intact. The following work by Homer is a great representation of this moment in which the hero adventurer, aided by the virtues of wisdom, courage, temperance, and justice, is at the threshold looking for the love of others to pull him back to the everyday world. 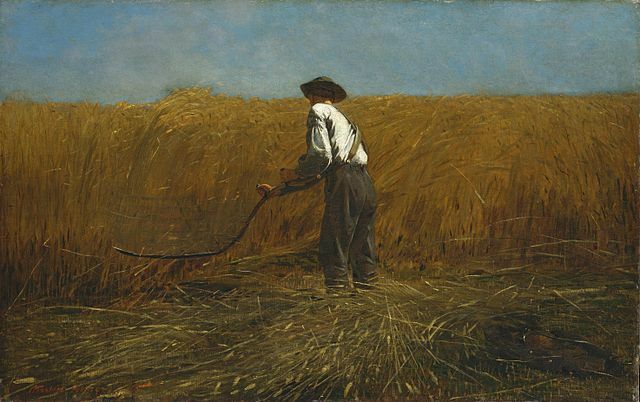 In this painting, the veteran has put aside his Civil War gear for those of the farmer. He has survived the war and is now willing to help his country begin a new period of growth and prosperity. But, he is alone. He needs help to reconnect to his community that he left to fight the war. In 1865, when this work was completed, is was uncertain if he would be accepted. Fortunately, he was accepted and the boon of his desire to help rebuild a new country was delivered to his countrymen and happiness was achieved for the veteran. As mentioned above, only with the love of one’s neighbor from those in the everyday world is the adventurer able to cross the threshold. This crossing brings great happiness to the adventurer and the boon to society. Just as with the veteran in the painting, the IOUs of life are now cashed in for happiness – the happiness of the returning veteran and the flourishing of society. The IOUs are the many trials and suffering of the veteran during battle that he was courageous enough to accept, remain focused to the task at hand, and noble to secure the boon that was his to find. He reward for these many IOUs are his happiness and the flourishing of his society. Spectacular art representing a spectacular way of living! This entry was posted in Uncategorized and tagged art, happiness, Homer, Joseph Campbell, self-fulfillment, Virtue on November 12, 2013 by oliver. Once the journey is completed, which is when each of us has achieved self-esteem, and before the beginning of the adventure to happiness, a call to adventure may be sent. If the call is sent, three things can happen: 1) the call can be unrecognized, 2) the call can be ignored, or 3) the call can be accepted. The call is often unrecognized either due to laziness or a lack of attention. The lack of attention can be due to distractions or the belief that there is not such thing as a call or summons to the adventure; as such, one does not need to be attentive to the call. Joseph Campbell, author of The Hero with a Thousand Faces, and The Power of Myth series on TV, teaches those who do not recognize the call, if sent, will progress no further and will lead an ordinary life and inconsequential life, with no chance for an adventure. If the call is recognized and eventually ignored, Campbell teaches that the individual will be denied the adventure and will lead a life of torment and despair. This life is much worse that that lived by those who do not recognize the call. Finally, if the call is accepted, according to Campbell the individual will be offered a chance for an adventure that, if successful, will lead to happiness. This painting’s intent was not to depict the debilitating effects of alcohol consumption. 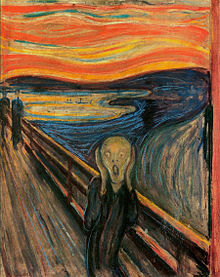 Rather, the artist was capturing the psychological isolation of people in public. 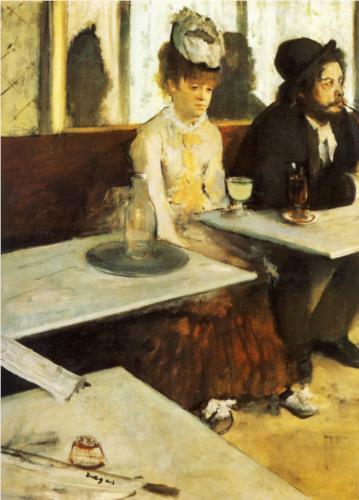 Both characters convey boredom with their lives and are situated at the top right of the frame, contributing to their lack of involvement with society. The characters do not seem in any hurry and appear resigned to their reality. Perhaps this is the artist’s conception of an everyday existence. This painting is one of the most recognizable in the world. It is a visualization of fear, the kind of terrifying fear felt in a nightmare. The long wavy lines carry the fear to all corners of the canvas. Behind the main character are two walkers on a road unaffected by the curves of the fear: even the railing is straight and unaffected. These walkers seem to exist in a separate world from the main character. This is a painting whose true subject is separation from others, literally, emotionally, and psychologically: a vivid representation of the refusal of the call. This picture presents extraordinary subtlety. The painting presents the path, previously taken, leading to the fork in the road where the girl is standing. She appears to have made her decision to journey upward along the road less traveled. The sunlight is bathing the girl in warmth. The picture does not show us where the girl is traveling except that it is an upward climb into the distance. The group on the right appears to be providing the force moving the plank upward so that the girl can reach the path leading to the left of the scene. Perhaps this is the artist’s interpretation of the acceptance of the call, with aid from the group of girls, and entrance into the unknown, willingly accepted. Next post, the poets’ interpretations. This entry was posted in Uncategorized and tagged call to adventure, Degas, fulfillment, happiness, Homer, Joseph Campbell, Munch on October 3, 2013 by oliver.